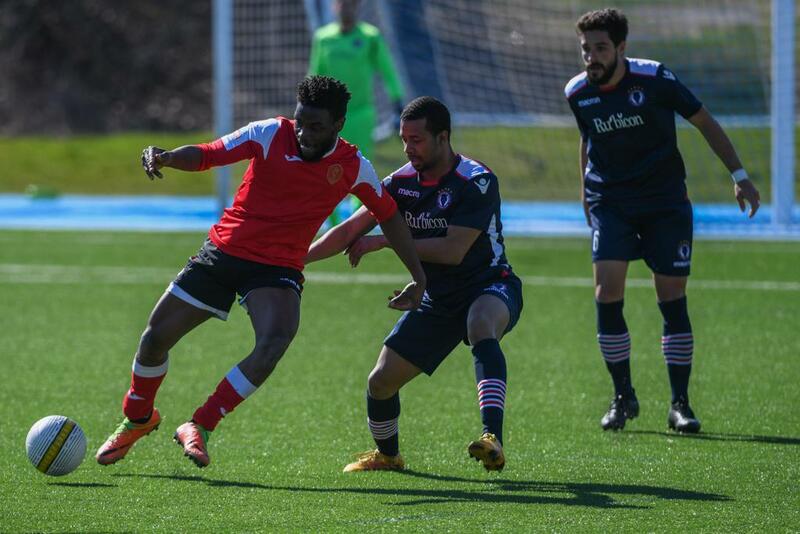 The Oakville Blue Devils secured a win and advance to the next round in the League1 Cup, as they beat Toronto Skillz FC in a 3-1 90 minute thriller. Both teams came out strong, with great scoring opportunities in the first half – however, Oakville Blue Devils would strike first in the 12th minute, as a Paris Junior Roserie shot found the back of the net off a deflection. Toronto Skillz did not let up all half and kept pressing, earning numerous corner kicks and forcing 12 free kick opportunities. Skillz goalkeeper Peter Katsaras was kept busy in the second half. After letting in an unstoppable shot in the opening seconds of the second half from Rajvir Khalon (46') he settled in and made highlight reel saves. However, a couple of unlucky bounces allowed Oakville Blue Devils to find the back of the net twice more in the second half. On the other end of the pitch, Oakville Blue Devils keeper Karman Saini was up to the challenge. Saini made critical saves and successfully defended a tight lead. Oakville were the more aggressive of the two clubs and fell into foul trouble, tallying 21 fouls in the match Saturday night. Even though they were missing their top goal scorer Anthony Novak, the Blue Devils were still able to convert multiple opportunities and provide great offence. Toronto Skillz, unfortunately, were the victims of a couple bad bounces and weren’t able to complete the comeback. With the win, the Oakville Blue Devils advance to the 3rd round of the League1 Cup and will take on Master's Futbol. Up next for Toronto Skillz FC will be a matchup with ProStars FC on June 3 (5:00 p.m.) at Birchmount Stadium in league competition. Click here to keep up on all the news, goals, wins and statistics for Toronto Skillz FC on their team page. As for the Oakville Blue Devils, they will host Windsor TFC on June 3 (4:00 p.m.) at Sheridan Trafalgar Campus in league competition. Click here to keep up on all the news, goals, wins and statistics for the Oakville Blue Devils on their team page.